Sign at entrance of the Elquemedo T. Willett park. CHARLESTOWN NEVIS (August 16, 2010) — Wednesday July 28, 2010 was described as a day of honour, pride and dignity for Nevisians as the park formerly known as Grove Park was renamed the Elquemedo T. Willett Park. It was a grand affair as persons from across the Caribbean and parts of the United States of America swarmed Charlestown to witness the historic event. 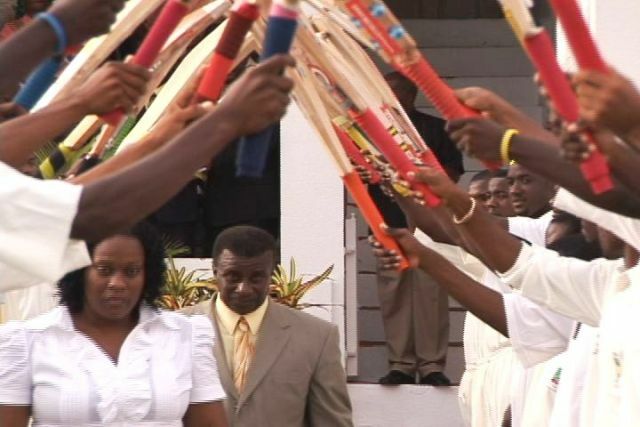 Ministers from the local and federal governments, senior civil servants, cricketers and friends and fans of Nevis cricketer, Elquemedo Willett were well attired and stood on both sides of the road as Willett and his wife, Sandra, arrived in grand style. Premier of Nevis and former cricketer, Honourable Joseph Parry, in his remarks, described Willett as “unassuming, confident and supremely talented.” He added that Willett’s success had promoted the island of Nevis more than that of any politician. Premier Parry also highlighted the benefits that Willett’s appointment to the West Indies Cricket Team had on Nevis. “Elquemedo was the man who broke down doors, who broke down windows and who smashed the roof to put Nevis on the map in the Leewards, in the Windwards, in the West Indies and in the world. “In our darkest hour with the loss of the Christena and so many lives, here comes Elquemedo Willett shining like the superstar he was, combining the skills with all the other players and putting back the light that was out by the Christena. This man gave to the nation once again, hope. He gave to this nation again, promise. He gave to this nation, politics. He gave us a new flowering,” Premier Parry said. Minister of Sports in the Nevis Island Administration [NIA], Honourable Hensley Daniel, in his remarks, highlighted many of Willett’s accomplishments. He recounted the circumstances surrounding Willett’s appointment to the West Indies Cricket Team in 1973 at the age of 19. “Back then you had to make the Leewards team then the Combined Islands Team to play Shell Shield Cricket before being considered for the West Indies team. Willett had broken down barriers at all levels where competition was fierce and insularity the order of the day to be even considered for West Indies. “Willett became Premier of Nevis in a roundabout way. He was the premier bowler, premier fieldsman and the head of gully of one of the premier batsman,” Minister Daniel said. Honouree Elquemedo T. Willett escorted by Protocol Officer Marva Pinney. “It is, for me, a distinct privilege as representative of Charlestown and as a graduate of the Charlestown Boys School to be taking part in a ceremony which honours a living cricketing legend of my youth. “There is perhaps no name more appropriate for this sporting facility at Grove Park than that of the extraordinary spinner Elquemedo Tonito Willett,” Minister Hector said. Willett, in his response to the renaming of the park in his honour, offered heartfelt gratitude to members of the NIA, his wife and all others who participated in the planning and executing of the official renaming ceremony. Elquemedo T. Willett was the first Leeward Islander to make the West Indies Cricket Team. His sons, Tonito and Akito Willett have also represented Nevis in the field of cricket.